Discussion in 'Houston Rockets: Game Action & Roster Moves' started by Invisible Fan, May 26, 2018. I wouldn't call this game a choke when refs erase your lead. Obv, we can't allow them to take away our mojo and cry for game 8. I didn't know Les was credited for Clutch City. 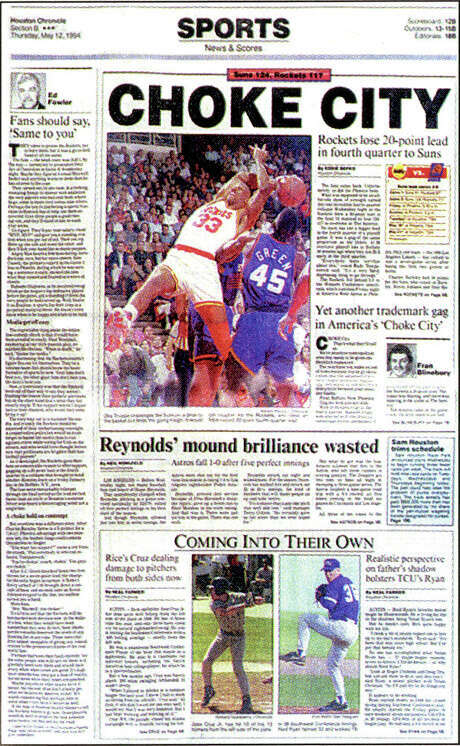 The memorable "Choke City" headline from May 12, 1994, after the Rockets blew a 20-point fourth quarter lead to lose Game 2 of the Western Conference semifinals to the Suns was the product of years of Houston sports frustration. Two words, in big bold black letters across the front of the May 12, 1994, sports section of the Houston Chronicle. To this day, it's arguably the most memorable sports headline in the newspaper's 117-year history. And it eventually led to a new identity for the Rockets. That headline - a key flashpoint during the Rockets' first championship run - turns 24 years old Saturday as the Rockets get ready to face the Warriors in the Western Conference finals. Here's the story of Choke City, in the words of those who covered it. Note: interviewees' job titles are those from May 1994. Past is prologue, and that certainly was the case with Choke City. It came on the heels of a rough 15-year stretch in Houston sports. The Astros had blown late leads in crushing season-ending losses in the 1980 and 1986 National League Championship Series. The University of Houston's Phi Slama Jama men's basketball juggernaut fell to unheralded N.C. State in a huge upset in the 1983 NCAA final. Then there were the Oilers, who suffered back-to-back playoff catastrophes in 1992 and 1993. The first including blowing a 35-3 lead in Buffalo, the worst collapse in NFL history. A year later, they gave up 21 fourth-quarter points to lose to the Chiefs in a divisional-round game at home. John McClain, Houston Chronicle NFL writer: Demoralizing and Devastating with capital D's. The Oilers' playoff loss remains the biggest choke in NFL history and perhaps the biggest in sports history. If they hadn't blown the Buffalo game, I don't think they would have blown the Kansas City game in the Astrodome. And had they won those games, I think they would have gotten the $186 million in public money Bud Adams wanted to help build his new stadium. So, in essence, the choke job at Buffalo lit the fuse that eventually led to the Oilers' leaving for Nashville. Charlie Pallilo, KTRH-AM sports talk host: Houston fan fatalism was probably at its all-time high. Rich Lord, KTRH-AM sports talk host: Disillusioned would have been a good word to describe the mindset of the Houston sports fan at that time. Fans were fed up with Bud Adams and thought of the Oilers as perennial chokers, Drayton McLane Jr., had just purchased the Astros and trimmed his payroll down to under $20 million, and I can clearly recall crowds of less than 10,000 at the Dome on a regular basis. And even though the Rockets would soon win a pair of championships, the mid-90s was also a time when the Astros were rumored to be considering a move to northern Virginia, the Rockets were looking into a possible relocation to New Orleans, and the rumblings about Nashville and the Oilers were just beginning. As the Oilers imploded again, the Rockets were going through their own drama. The 1992-93 season ended with a Game 7 overtime loss at Seattle in the second round. That fueled the team for 1993-94, which started with a 15-game winning streak. Then on Feb. 4, the Rockets agreed to trade Robert Horry, Matt Bullard and two second-round picks to Detroit for Sean Elliott. However, that deal was kiboshed a couple days later when it was discovered Elliott failed his physical because of a kidney condition. The Rockets went on to win the Midwest Division with a 58-24 record and beat Portland in four games in the first round. The day before the second-round series against the defending Western Conference champion Phoenix Suns began at The Summit, the Rockets got a gift when Seattle was upset by Denver, the first time a No. 8 seed beat a No. 1. The next day, on Mother's Day, the Rockets blew an 18-point lead and lost 91-87 to the Suns in the series opener. Afterward, Rockets guard Vernon Maxwell lashed out at the crowd that was about 1,500 shy of capacity. "Our fans are the worst," Maxwell said. "And you can write that. Tell them I said that. To hell with them. We can't even sell out the second round of the playoffs. We were up in Portland the other night and couldn't even hear on the court. And now, we're home and the fans are booing us. That's not what we need. When we make a mistake and get down, we need to be picked up. To hell with them." 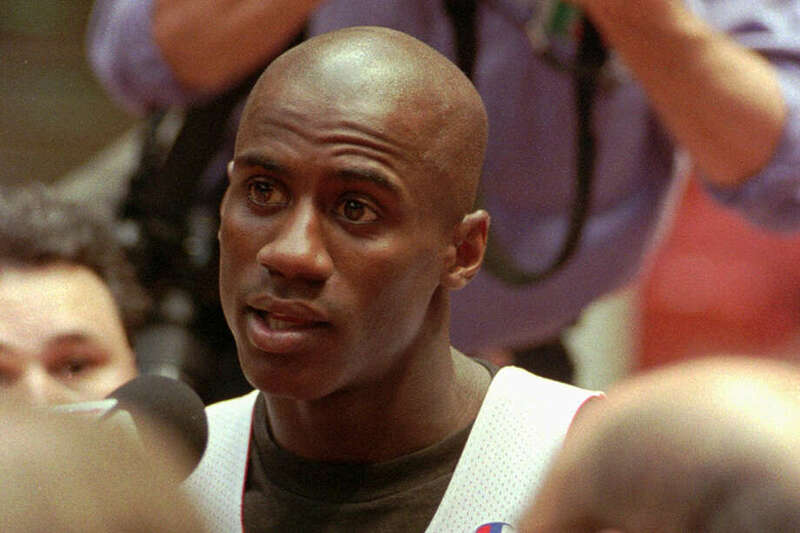 After Game 1 of the 1994 Rockets-Suns series, Vernon Maxwell ripped Houston fans for not filling The Summit. That led to a sellout in Game 2 - and even more heartache. Robert Falkoff, Houston Post Rockets beat writer: (Maxwell's rant) really spurred the fans and I think they sold the game out in 45 minutes for Game 2. For three quarters, the Rockets looked like they had put Game 1 behind them, taking a 100-82 lead into the final 12 minutes. Fran Blinebury, Houston Chronicle columnist: I had told one of the security guards at The Summit that it was in the bag at the end of the third quarter. I thought it was. The fourth quarter was a nightmare for the Rockets, who only made one shot in the final 10 minutes as the Suns went on a 24-4 run to erase a 20-point deficit - the biggest fourth-quarter collapse in NBA playoff history at the time - and force overtime. Phoenix cruised in the extra session for a 124-117 victory and 2-0 series lead. Blinebury: It was like watching a car crash in slow motion as they let the lead get away. I remember thinking, "This can't really be happening again. Another Houston choke?" Falkoff: To have a full house and to play great for most of the game and to let it get away, it was just a sense of anger, bewilderment and shock all in an emotional ball is the way I remember it. Matt Thomas, Rockets public-address announcer: I remember the roof close to being blown off in each of the games. Game 1 was a lot of "we got this" followed by "what is going on?" Game 2 was more "please don't let this happen again ... oh my God, it's happening again." One thing that must be taken into account is the media landscape in May 1994. Houston, like many major cities, had multiple newspapers. The Chronicle and Post were fierce competitors until the latter's demise in April 1995, but Chron.com didn't launch until 1997, meaning the print product was the primary vehicle for news. The city was still months away from its first all-sports radio station. Also, there wasn't the access to watching games as there is now. TNT's telecast of Game 2 was blacked out in a 35-mile radius of Houston and only available locally via pay-per-view. Falkoff: Back in 1994, at 6 a.m. people were scrambling to find the newspaper. That's where they got the news. Now, you can just get your phone whenever and find out things. Back then, those kinds of headlines stuck with people more than they do now. After the Rockets completed their collapse and fell into an 0-2 hole, reporters and editors went to work on tight deadlines following an overtime game. The Chronicle and Post each had multiple reporters on site. Reid Laymance, Houston Chronicle deputy sports editor: I was at the game as the on-site editor for the Chronicle. We worked in a small room underneath the stands at the Summit. We didn't have cell phones yet but the workroom had a few phones we shared. Even though it had been over a year since the Oilers-Buffalo game, that was still in our minds. As the Rockets blew it, Fran Blinebury started writing his column. The Oilers-Bills, The Cougars-N.C. State, this game ... Choke City, he wrote. Blinebury: Choke City summed up everything. Reid Laymance and I were together in the media work room right after the game. We looked at each other and said "Choke City. That's it, right?" I told him I was running with that theme. In my column, I recounted the past failures by all of the previous Houston teams and the only question was, do we make it the headline? Laymance: We had been doing our headlines in a bigger size and bolder typeface during the playoffs. It seemed like the natural headline. I'm not sure if I called it in to the office or went back downtown, but the headline seemed to fit the mood. John P. Lopez, Chronicle staff writer: It was an era for the bold, one- or two-word headline in our department. Those types of headlines were commonplace. In fact, after Oilers games or other big games, a lot of times writers would call in or write in suggestions for the bold head. It was a conscious decision by (executive sports editor) Dan Cunningham and others to do it that way and it made for some great hard-hitting headlines. The style was typical. The blunt honesty, not so much. Charlie Crixell, Houston Chronicle sports copy chief: As the sports slot (essentially, the producer of the section) that night, I remember that when the Rockets had their huge lead in the fourth quarter, we started preparing the page for a positive headline and design. Back then, the slot essentially designed every page in the section, including the cover, so that's why the covers didn't have the more polished look with a lot of bells and whistles like they do today. When the game ended, I was still in composing when the type came out of the processor with "CHOKE CITY" at the top. I don't recall who came up with it or when, but when one of the printers waxed up the type and slapped it down on the bank to cut up and put on the page, all I could think was, "That's perfect." Keith Kuepfert, Houston Chronicle copy editor: I didn't like "Choke City" because it was too negative, the other team generally has a hand in such comebacks. I wanted "Buffaloed" because of what happened to the Oilers. Eddie Sefko, Houston Chronicle Rockets beat writer: The main thing I remember from that stretch was that the term "Buffaloed" had been tossed around as a possible headline, playing off the collapse against the Bills by the Oilers. But "Choke City" was clearly a better choice. Blinebury: I give Reid credit for having the nerve to step up and use it in big, bold type. Yes, it was jarring. Yes, it was a shot right between the eyes. But I maintain to this day that it was exactly the gut reaction of every diehard Houston sports fan the next morning. 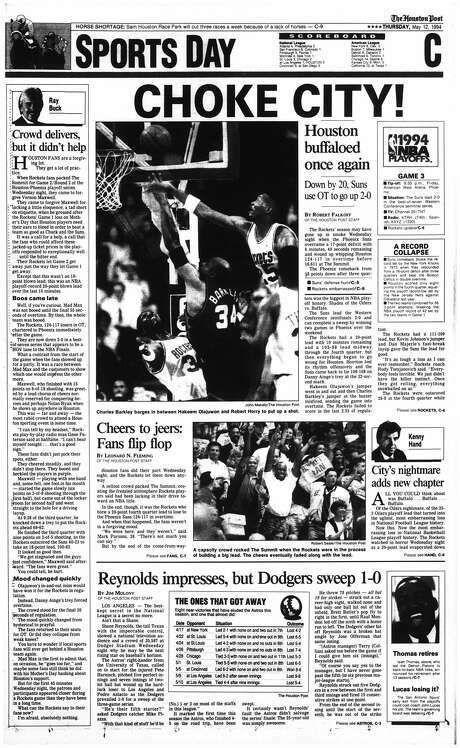 But the next morning, readers saw not just one, but two "Choke City" headlines as it also was the headline - with an exclamation point - in the final edition of the Post. Dan Cunningham, Houston Chronicle executive sports editor: I was in the stands that night, so I did not see the headline until the next morning. I didn't like the headline because I don't like the word "choke" and considered it a bit extreme. I liked it even less when I saw that the Post had the same headline. Surprising would be putting it mildly. I can't ever remember that happening again in my 43 years with newspapers, where both papers used the same exact headline. Falkoff: I had no input into it. Obviously, as a reporter you're just trying to get your story in. I'd never seen it before. A variation maybe of a headline, but to see the very same headline, it was something I'd never seen. Back then, most cities, if not all of them, were two-paper towns so you'd pick up both papers and I can't recall ever recall seeing the same headline exactly in both papers. It was almost as shocking as the game itself. Crixell: When we later learned that the Post had the same headline, it just reaffirmed that thought in all of us – it had to be perfect if two entirely different sports copy desks came up with the idea independently of each other. 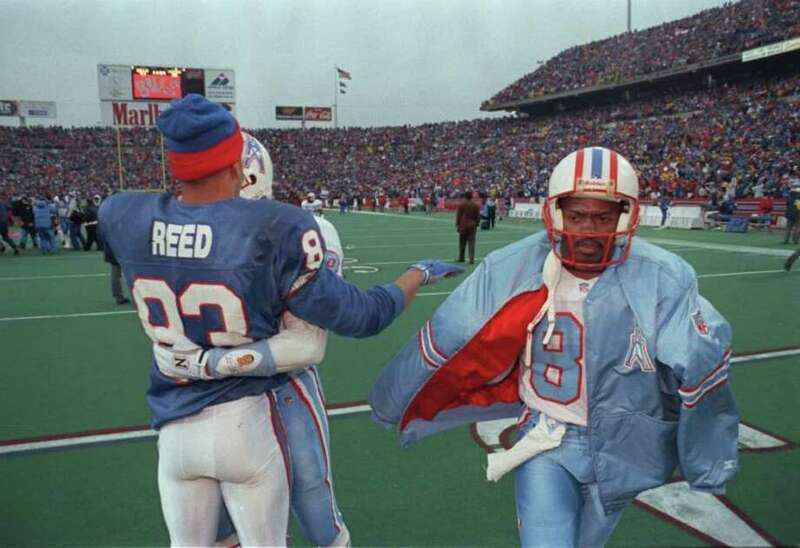 The wounds from the Oilers' collapse in Buffalo during the 1992 NFL playoffs were still fresh by the time the Rockets blew the first two games against the Suns in 1994. Cunningham: Reaction was immediate — and strong. Most people were critical, but obviously a large segment of the fan base felt the same way after that game. The headline was not typical of the Chronicle at the time, and certainly it was a culmination of the frustration that had built up in Houston over the years — especially in the wake of the Oilers' historic collapse in Buffalo. Lopez: The biggest misconception about the Choke City headline, especially for younger or new Houstonians, is that it was about that Game 2 loss to Phoenix. That headline merely was the exclamation point to the worst, most bizarre decade of sports this city ever has seen. This city's sports fans were collectively battered and beaten and resigned to ultimate failure - and probably in the most painful of ways. Losing the first two games to the Suns, including a 20-point fourth-quarter lead at home? For Houston fans, that was child's play. The headline could just as well have been: "No Surprise." McClain: Houston fans were conditioned for the worst. They expected the worst and couldn't realistically hope for the best. No lead – whether in a game or series – was safe. Falkoff: I think it reminds me of this old movie "Network" with the line "I'm mad as hell and I can't take it anymore!" I think the headline writers reflected the feeling in the community. Pallilo: I definitely recall thinking "that's not inappropriate." They did choke! Credit to the Suns but blowing a 20-point fourth-quarter lead at home was a palpable, absolute Rocket choke job. ... The natives were several levels beyond restless. Down 0-2 essentially no one was thinking what was to come looked viable. Everyone knew the door was open in '94 with (Michael) Jordan retired and then more so when Seattle was bounced in the first round. There was a lot of anger and exasperation over opportunity seemingly blown. Thomas: It was very much here we go again ... will the city of Houston ever win a title? What did we as Houston sports do to deserve postseason failure again? I took a lot of "I can't take much more of this" calls in the early days of my radio career. Rockets coach Rudy Tomjanovich (to the Houston Chronicle's Jonathan Feigen in 2014): I was thinking I was going to be part of Houston sports history as the dummy who got us into Choke City. I was surprised by the reaction in the paper, how big it was. It was the full page, the headlines. I thought, "This could be stuck to me the rest of my career." That was the thought that went through my head. As for the Rockets themselves, they flew to Phoenix immediately after Game 2 and weren't around for the morning-after reaction. Before Game 3 in Phoenix, Mario Elie said "Everybody in Houston is saying we're a Choke City. Right now, that's appropriate." Elie even wrote "Choke City" on his shoes as a reminder. Maxwell said "I thought it was kind of funny." The Rockets then flipped the script in the desert, winning Games 3 and 4 to tie the series. They went on to beat the Suns in seven games. Lopez: At the time, in the newsroom we didn't really know it had become the rallying cry for the Rockets. We only knew a lot of people over there didn't like it. I honestly don't remember hearing about a single fan complaining, until after the Rockets had completed the comeback. Like I said, at the time most fans probably expected nothing less. Blinebury: The team reaction was interesting. They were stunned, shocked, embarrassed collectively and as a group expressed outrage. But I had great relationships with every player and coach in that locker room and I did not have a single one of them confront me in anger or to tell me I was wrong. Nobody in the media has had a better relationship with Hakeem (Olajuwon) and we talked frequently. He didn't call me out or challenge what I said. Not a volatile guy like Vernon Maxwell. Not Otis (Thorpe). Not Mario. Not Rudy T. They all knew what happened. They used it as something to rally round. It was fuel for them. It lit their fire. They could talk about the media in general or the doubters and then go out prove us all wrong. In fact, the first time anybody in the organization said anything about it to me personally was in the final seconds of Game 4 at Phoenix when the Rockets had come back to tie the series at 2-2. (Owner) Les Alexander came from behind the press table at courtside, stuck his head right between beat writer Eddie Sefko and me and said: "Clutch City." By the time the Rockets beat the Suns in Game 5 of their second-round series, fans had adopted the "Clutch City" mantra that owner Leslie Alexander coined after his team's Game 4 win in Phoenix. It lives on to this day. "Clutch City" took hold after the Rockets defeated the Suns and then Utah in the Western Conference finals before downing the Knicks in a seven-game NBA Finals to win their first championship. 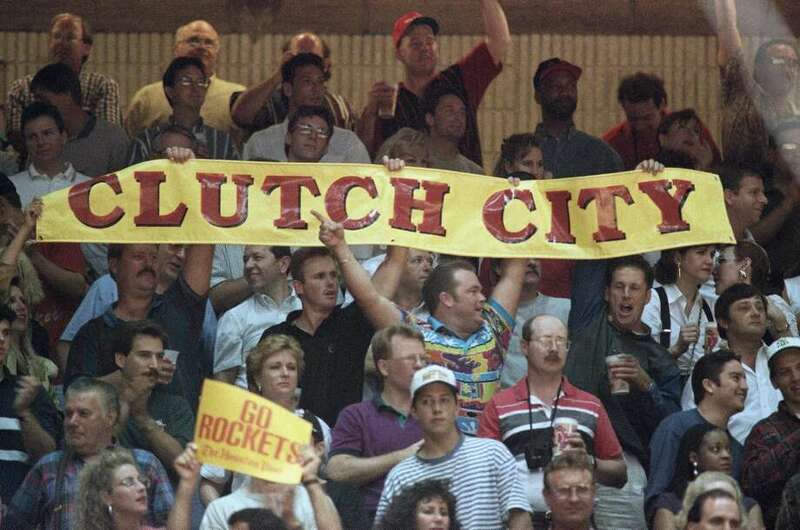 "Clutch City" remains the franchise's rallying cry to this day and also is the name of its charitable foundation. And the headline that inspired it hasn't been forgotten. Falkoff: It was kind of a knife in the back in the time, but the headline writers kind of woke up the team. They just weren't going to go out that way. (The headline writers) might've been the catalyst, who knows. David Barron, Houston Chronicle assistant sports editor: It is interesting that the phrase had such an impact in a time of no social media and limited sports radio and that it continues to be significant to people years later. It helped, of course, that the Rockets won the series and that Les was able to pitch the "Clutch City" moniker as a replacement. Laymance: I felt a little awkward the following year. My older son was a big Mario Elie fan so during the preseason, I took him to a Rockets practice to meet Mario. Mario was very gracious but I didn't quite feel like telling him it was my headline. What's funny now is that the Suns' rally (or Rockets' choke, depending on your perspective) isn't in the record books anymore. Houston had led by 18 going into the fourth and by 20 early in the quarter that night. The record is now 21, and coincidentally I happened to be there. Working for the Boston Globe in 2002, I was the on-site editor for an Eastern Conference final game between the Nets and Celtics. Boston trailed by 21 entering the fourth and rallied to win, 94-90. I wrote a short for the Globe that day, referring back to the Rockets' blown lead of 1994. The gist was don't get too confident after making a rally like that because as Rudy T said of his Rockets they had to be pretty good to get that lead in the first place. The Nets won the series, 4-2. Lopez: I thought it was fantastic. Painful, but a fantastic headline. I mean, think about it: It will go down as the most memorable headline in the history of this city, for better and worse. It did its job. Blinebury: It was the birth of a cause and a rallying cry and gave the entire franchise an identity. Sam Cassell, Mario Elie and Hakeem have all told me there would have been no Clutch City without Choke City. Nearly 25 years later, the Rockets' Clutch City Foundation still exists and does great work. By the way, at the 20th anniversary celebration (of the repeat titles) in 2015, Elie went on the record when we spoke: "OK, now after all this time, I can admit it. We choked." I don't think there's any question that it's the most memorable Houston sports headline in history. Even all these years later, Choke City has a way of sticking in your, well, throat. Fam I feel your pain. I want to beat those Warriors so bad - but HOW? They are stacked. Without our little general, I am losing hope. "Houston fans expected the worst". So...when the Rockets lose game 3, is it time to Revive "Choke City"? Is this karma for Oilers-Bills '93?